SINGAPORE (THE NEW PAPER) - It was a sight to behold: Racks of red, raw meat hanging outdoors to dry in the heat of dusty air-conditioner compressor vents along a second-storey HDB corridor in Beach Road. At the first storey of a nearby block, trays of the same strips of meat propped up by overturned plastic stools were also left outside to dry in the sun. These racks of meat were allegedly meant for making meat jerky for sale - both directly to customers from the "home manufacturer" and from a store at the nearby Golden Mile Complex. A 60-year-old man told Shin Min Daily News that he goes downstairs to sun-dry the meat almost daily. On good days, he claimed, he can get the meat about 80 per cent dry, after which the meat will be cooked and sold at the store or on the street, he added. The less-than-hygenic practices have disgusted residents at the Beach Road blocks, who sent the pictures of the raw meat, including images of insects crawling on them, to the Chinese evening daily, which carried a report on Sunday. The residents complained that they have to avoid the corridor at Block 1 Beach Road because of the stench. The drying meat also allegedly attracted flies and birds. The National Environment Agency (NEA) is investigating. An NEA spokesman told The New Paper yesterday: "(We) received feedback on the drying of raw meat at Blocks 1 and 6 Beach Road in front of air-conditioning compressors and along a corridor respectively, and the sale of this meat after being processed. "NEA will not hesitate to take firm action against anyone found to be in violation of the Environmental Public Health Act. We would also like to advise members of the public who come across food prepared in poor hygiene conditions to not purchase it, as the food may be unsafe." When The New Paper visited the HDB unit where the air-conditioner compressors are yesterday afternoon, the racks had been removed, but small pieces of shredded dried meat could be seen strewn on the corridor floor. Barbecue racks were also propped up near the compressor vents. At Block 6, where the raw meat was allegedly left outside to dry in the sun, there were no evidence of any drying taking place. Residents TNP spoke to expressed disgust at the practice. One resident, who declined to be named, said they avoided the corridor because of the stench. She said: "I don't remember exactly how long this has been going on, but it has been years, at least two to three, as far as I remember. "They don't do it all the time, but whenever it is hot or sunny, they usually will do so." 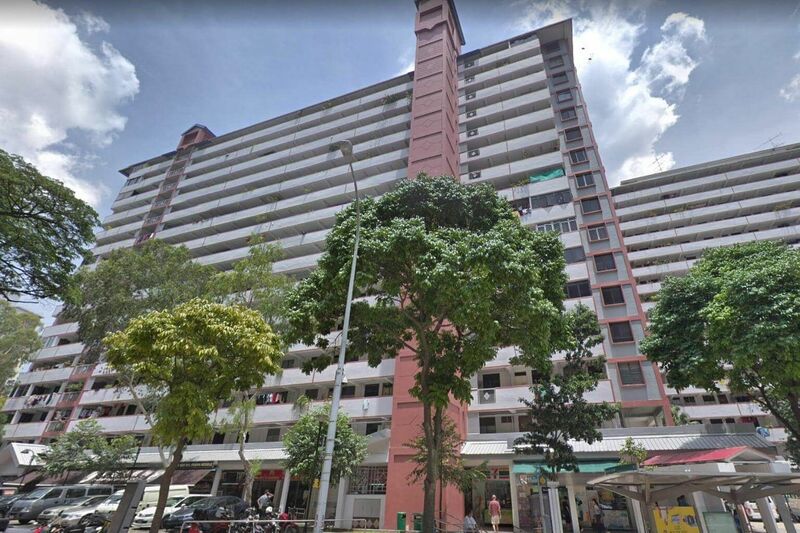 Another resident told TNP in Mandarin: "It is not the owners of the unit where the vents are, I think. I see people turning the corner behind my flat in the morning with the meat." She added: "When the wind blows in my direction, I can smell the stench from the raw, drying meat. It is so unhygienic, who would even eat it?" When TNP visited the store at Golden Mile Complex yesterday, there were no boxes of meat jerky on sale. An employee manning the store declined to allow us to contact her employer but revealed that NEA officers had visited earlier in the day to ask about the meat jerky. She said they were no longer selling the product. According to Shin Min Daily News, the store had been selling the product for about a year and a half. The report said that the person in charge of the store claimed to not know how the product was made. He added that they sold 20 to 30 boxes of the jerky daily but are planning to stop selling it. Regular customers of the jerky told Shin Min Daily News that they have been eating it for years and do not find the drying method unhygienic. One 27-year-old foreign worker who regularly patronises the store said: "These meats are manufactured by a Thai woman in her forties using methods similar to those used back home. "When eaten, it tastes especially of home."